I am always on the lookout of introducing more variety in my older munchkin’s breakfast in the hopes that one she will one day find her favorite one! Breakfast is definitely not her favorite meal..I know she will be truly ecstatic if we tell her you don’t have to eat your breakfast today but that is not happening anytime soon. One of my friends told me her kid loves Sweet Cheela and gave me the recipe to try it out for T. It was a big hit with me but she was not too excited about it! So the next time, I tried I decided to turn them into pancakes by adding baking soda and baking powder and it was an instant hit! 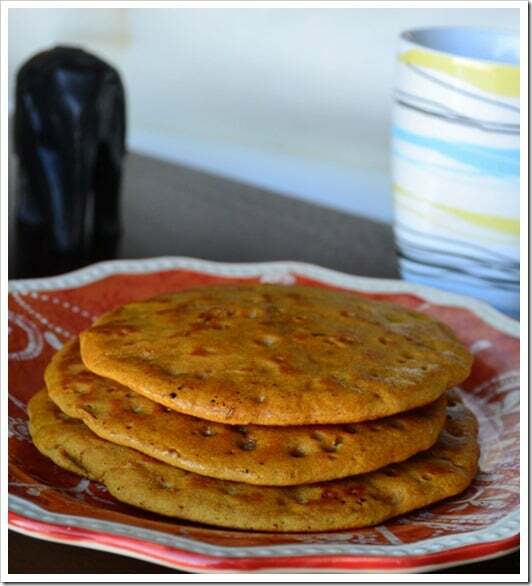 This recipe almost tastes like Puran Poli and it is simple enough that it can be made during busy weekdays too! 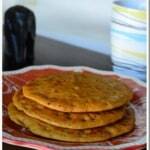 So here’s the recipe for both – Sweet Cheela as well as Whole Wheat pancakes. Add the baking powder and baking soda if you want to turn your cheela into pancakes! Whisk all the ingredients (except oil) well to remove any lumps.The resulting batter will be of the consistency of pancake batter. Over medium-high heat, add a teaspoon of oil to a shallow frying pan. Pour a ladle of the batter on the pan and let it spread on its own. Serve hot with a sliver of butter.